Why does the tail wag the brain? What is virtual autism? Why can't our avatars walk hand-in-hand? Will a nonverbal Babel fish save the world? Jeffrey Ventrella, a seasoned virtual worlds programmer and visual language expert, reviews the history of avatars, smileys, and other expressive forms, and considers a future of spectacular creativity. This book combines thoughtful scholarship with amusing anecdotes from the trenches of Silicon Valley. 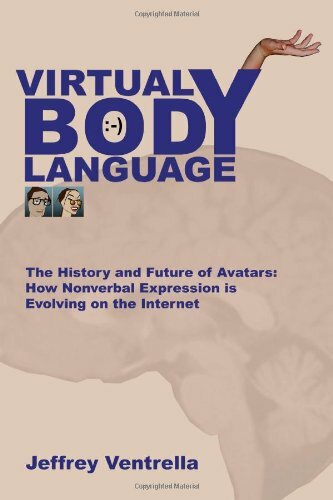 Virtual Body Language presents a thorough analysis of the neurological, linguistic, aesthetic, and technical aspects of how nonverbal communication can be distributed over the internet. Based on nearly a decade of avatar development,Ventrella has the practical foundation on which to justify even the most outrageous claims, regarding what "avatar" might mean in the future.